Even the most experienced counselors have difficultly spotting a recovering alcoholic in danger of relapse. Brain imaging scans might do a better job, new Yale research suggests. 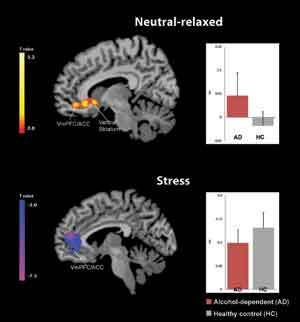 Alcoholics with abnormal activity in areas of the brain that control emotions and desires are eight times more likely to relapse and drink heavily than alcoholics with more normal patterns of activity or healthy individuals, according to the study published May 1 in the journal JAMA Psychiatry. The research is funded by the National Institute of Alcohol Abuse and Alcoholism at the National Institutes of Health. Dongju Seo of Yale is first author of the study. Other Yale authors include Cheryl M. Lacadie, Keri Tuit, Adam K. Hong and R. Todd Constable.